Regulations should be coherent, logical, and practical. There should be a clear nexus between regulations and agency goals and objectives whether explicitly or implicitly stated. Agency positions should be readily understood and easily applied. The NRC has a double challenge when it comes to clarity. We are a regulatory agency that derives its authority from a series of laws passed by Congress and we regulate a highly technical industry with many of our experts holding advanced technical degrees. For those reasons, it can sometimes be challenging to explain what we do and why we do it. Over the years, the agency has employed a variety of different ways to communicate with clarity. This blog and all our social media platforms are one avenue. Producing less technical executive summaries for otherwise quite complex documents is another way. We often work with technical experts to help prepare them for public meetings and to ensure their presentations are “user friendly” for the audience expected to attend. The agency’s training center offers many courses to help technical experts present their complex work clearly in a way that is more accessible for both technical and non-technical audiences. The agency’s website also provides a wealth of information to meet the needs of both technical audiences and the general public. Even our student corner section helps clarify the agency’s mission and activities. The NRC’s work may involve an abundance of acronyms and technical jargon, but we are always striving to convey what we do and why we do it in the clearest way possible. This post is the fourth of five that will explore each of the five principles separately. For the history of the Principles of Good Regulation, read this post. The American taxpayer, the rate-paying consumer, and licensees are all entitled to the best possible management and administration of regulatory activities. The highest technical and managerial competence is required, and must be a constant agency goal. NRC must establish means to evaluate and continually upgrade its regulatory capabilities. Regulatory activities should be consistent with the degree of risk reduction they achieve. Where several effective alternatives are available, the option which minimizes the use of resources should be adopted. Regulatory decisions should be made without undue delay. The principles of good regulation are critically important to the day-to-day operations of the agency. They’re our guide posts. They’re touchstones to help us be sure that we’re properly executing our mission. As the chief financial officer, I am partial to the efficiency principle. It is one of the reasons that I come to work every day. We are not only federal employees but also taxpayers and citizens, so we should be sure that we’re taking care of the nation’s resources appropriately. In addition to the payments we receive from our licensees, the NRC also receives an appropriation from the Congress each year. It’s “your money” and “our money” at the same time. Efficiency as we execute the agency’s work supports both the public good and the expectations we have as individuals for the best value we can offer. As part of our focus on efficiency, the NRC has an initiative underway to improve our ability to plan and execute our mission. Known as Project Aim, this is an effort to find ways to better adapt to a dynamic environment and changes in workload. With direction from our Commissioners, the staff is working to “right-size” the agency to ensure we have the skills we need to accomplish our mission; to use agency resources more wisely; to improve the timeliness of our decision-making and respond quickly to changing conditions; and to promote unity of purpose through clearer agency priorities. As Steering Committee co-chair, I have seen a lot of creativity from the staff as we work though the initial 19 tasks approved by the Commission, especially as we work to make processes more efficient and to shed unnecessary work. By the time we complete this effort, the NRC will have saved a total of nearly $50 million. That’s real money in my book. This work requires us to find the right balance to make sure we are meeting our safety mission while delivering results in a timely and cost-effective way. As an example, we aim to review applications in a timely manner while ensuring safety and security. Meeting this goal depends in part on receiving complete, high-quality applications. Many of our programs have implemented acceptance reviews, which give NRC staff a chance to make sure an application is complete before we begin our detailed technical reviews. If we find things we think are missing or would otherwise slow down our technical review, we ask the applicant to supplement their application. This process saves the licensee money and allows our staff to work on other activities until that application is ready. For me one of the most important purposes of the principles is cultural. There are many different roles here at the agency. You hear people talk about being a technical or Commission office, as compared to people who provide corporate support. Or the distinction between people in the regions and those here in Rockville, Md. But, no matter your role, the principles apply to all of us. They are a unifying aspect to our culture. I can sit in a meeting with my colleagues in operating reactors or in nuclear materials and wastes and we’d still have an important shared vocabulary that is meaningful and helps us transcend our individual goals and move together toward the right solutions. This post is the third of five that will explore each of the five principles separately. For the history of the Principles of Good Regulation, read this post. This represents an earlier retirement of the reactors than proposed in the company’s license renewal application, which sought an extension of Unit 2’s operating license to April 2033 and Unit 3’s to April 2035. Entergy cited the low cost of natural gas and rising operating costs as primary factors in its decision. The company said it would instead pursue a license renewal for Unit 2 to 2024 and for Unit 3 to 2025 to allow operation until then in the event the plant’s power output is still needed. Company officials offered assurances that there would be continued adherence to safety requirements for the remainder of the plant’s operational life. NRC inspectors will be on hand to independently verify that all safety commitments are being met. The NRC has three full-time Resident Inspectors assigned to Indian Point. We also send specialist inspectors to the facility to assess such areas as security, radiation safety and reactor operator training. Agency staff will also have to complete their license renewal reviews and the hearing process will have to be brought to a conclusion. With respect to the latter, a motion to withdraw the remaining contentions in the hearing process is expected today. It will be essential for Indian Point employees to maintain a strong focus on safety no matter the plant’s eventual end date. It will be incumbent upon the NRC to ensure that is occurring. Nuclear regulation is the public’s business, and it must be transacted publicly and candidly. The public must be informed about and have the opportunity to participate in the regulatory processes as required by law. Open channels of communication must be maintained with Congress, other government agencies, licensees, and the public, as well as with the international nuclear community. Most of us in the NRC’s Office of Public Affairs were trained and have worked as either print or broadcast journalists. That background and our experiences in trying to get information from many different organizations make us all strong advocates for an open flow of information and access for all. 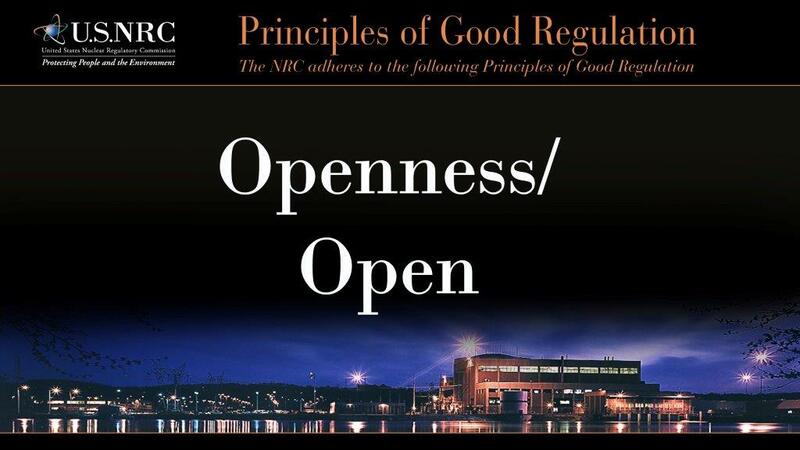 The NRC Principle of Openness is a real-world standard that guides everything we do. Some of the NRC’s activities generate quite a bit of public interest while others may garner little attention. No matter what the issue may be, our goal is always to provide the media and the public with as much information as possible, allowing them to learn about what we do or take an active role in our regulatory process. We provide letters, reports and other documents on many of the agency’s activities, including detailed information before we issue a license, when we update our regulatory requirements and even when we have technical questions for our applicants or licensees. We believe all people and groups interested in our policies and actions must have access to clear and understandable information. We hold public meetings near the facilities we regulate, at NRC headquarters and in the four regional offices. Documents and correspondence related to license applications and inspection findings, with the exception of security-related, proprietary, and other sensitive information, are made available through the agency’s web site. The agency also typically issues news releases when it receives license applications and to announce public meetings, opportunities for hearings, and other public involvement activities. We also use several different social media tools including Twitter, Facebook, this blog and others. Copies of key documents may be sent to federal, state, local, and tribal authorities, published in the Federal Register, and made available on the NRC web site. Librarians at the NRC’s Public Document Room are available to assist in accessing or obtaining copies of the agency’s documents. We have also established a process to respond to requests made under the Freedom of Information Act. It can sometimes be frustrating to try to find information from a federal agency or other large organization, but at the NRC, we want to reduce or eliminate that frustration as much as possible. We may not always succeed, but we take the Principle of Openness very seriously and work hard to achieve that goal. This is the second of five posts exploring each of the Principles of Good Regulation. For the history of the Principles of Good Regulation, read this post. 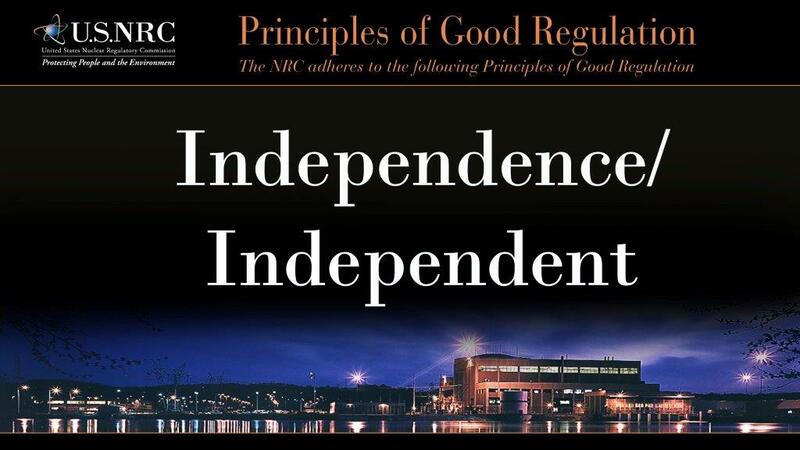 My aim in this post is to explore with you the meaning and implications of the first of the NRC’s Principles of Good Regulation: “independence.” At a glance, this might seem a simple task. “Independence” is one of those concepts like “justice” or “liberty” — we know what it is, we know what it looks and feels like; however, we have trouble, if asked, to precisely define it. It is one thing to say what independence is. It is wholly another to say how one should go about being independent in particular circumstances. This presents an essential paradox. We must not separate ourselves, but rather to engage with all those who have a stake in the work of the agency. To meet its charge of independence, the NRC must ever be proactively attuned to the views of licensees, state and local governments, and the interested public, all the while maintaining some necessary degree of separation to preserve our objectivity. “Independence,” in the context of the NRC’s principles, thus does not mean simply “self-reliant isolation,” but rather something more akin to “impartial engagement.” And therein lies the rub. So long as the NRC is faced with a plurality of conflicting public views and interests–an ever-present fact of life at the NRC–impartial engagement is a complicated balancing act, a never-ending tightrope walk. Each year, in the late spring and early summer, the NRC conducts public annual assessment meetings for each of the reactor licensees. Some of these meetings are heavily attended–so much so that often there are far more members of the public who wish to speak than the allotted meeting time would permit. As a facilitator for those meetings, I must devise the public speaking order, knowing that this decision will determine who will get to speak at the meeting and who will likely not. As illustrated by the dialogue that follows, I have struggled with how to achieve an impartial balance that fully and fairly provides an opportunity for the conflicting views at those meetings to be voiced. One option is to choose the speaking order by lottery. Picking names out of a box would be an impartial solution. But is that fair to those who arrived early to secure themselves a place in the speaking order? Another option is to have one sign-up list at the registration table, and we’ll call people in chronological order. First come, first served. But couldn’t that lead to some people queuing up hours in advance? Will the meeting space allow that? And what if those arriving early are members of one group? Don’t we have a responsibility to make sure that we hear from a variety of viewpoints? Perhaps we should have two sign-up lists: one for those for and one for those against? How about adding a “neutral” sign-up list? That may solve some issues, but could present more. What happens if everyone just signs up on the neutral list, which would usually be the shortest? Or what will we say to someone who didn’t get to speak because he or she signed up on the ‘pro’ or ‘con’ list, while someone who arrived later did get to speak because that person signed up on the neutral list? We weigh these options, and sometimes others. Any time we seek input into our decisions, we face this struggle to maintain impartial and balanced engagement with a plurality of stakeholders with conflicting views. It’s a balance we have to strike, and inevitably, we won’t please everyone. However, it is a task that NRC employees must fully embrace if the agency is to live true to the vision of independence ensconced in its principles. This post is the first of five that will explore each of the five principles separately. For the history of the Principles of Good Regulation, read this post. While the NRC always considered itself a principled regulator, it was not until Jan. 17, 1991, that the agency developed written principles that encouraged regulatory excellence and addressed inadequate performance. 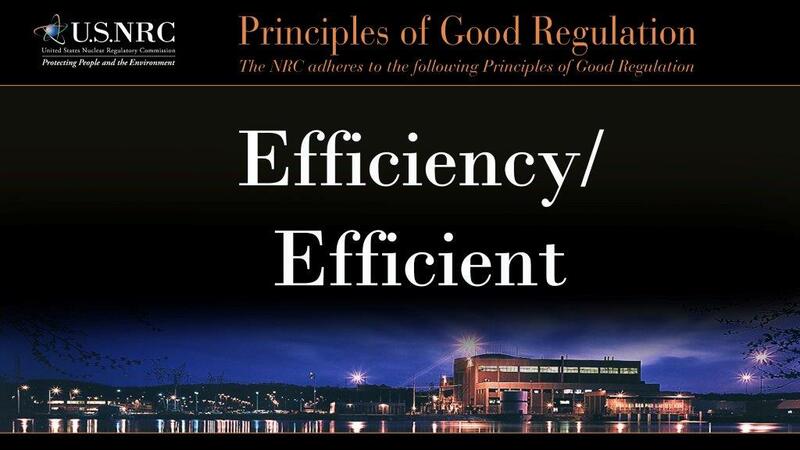 Those principles – five traits of what a good regulator should be – were authored by then-NRC Commissioner Kenneth Rogers. Today, they form the basis of regulatory regimes throughout the world. To celebrate the anniversary of the NRC’s principles, we’ve produced a video focusing on the historical evolution and application of the principles. Next month , we’ll post another video looking at how NRC staff view the principles today. It’s important to consider the well from which the principles sprang some 25 years ago. In the 1960s, critics attacked federal agencies responsible for environmental and safety regulations for being too secretive and too friendly to the industries they regulated. The NRC’s predecessor, the Atomic Energy Commission, was stung by accusations that it promoted nuclear power rather than protected public safety. The Energy Reorganization Act of 1974 split the AEC, and consolidated the licensing and related regulatory functions into the newly created NRC, an independent regulator. But the NRC, too, soon came under fire for its vague, complex and inefficient regulation. The NRC responded by establishing more flexible regulations and clearly defined safety goals. By 1989, when Rogers first proposed the principles, the NRC was seeking to balance its independence with demands that it be an open, efficient, clear and reliable regulator. Rogers argued that the staff should have consistent guideposts in changing times to remind them of the proven elements of good regulation. Two years later, the Commission agreed, and the principles-of-good-regulation-announcement-january-17-1991 became part of the agency culture. Many years later, in 2011, President Obama signed an executive order calling for principles of regulation for all federal agencies. Independence (Independent): Nothing but the highest possible standards of ethical performance and professionalism should influence regulation. Openness (Open): Nuclear regulation is the public’s business, and it must be transacted publicly and candidly. Efficiency (Efficient): The American taxpayer, the rate-paying consumer, and licensees are all entitled to the best possible management and administration of regulatory activities. Clarity (Clear): Regulations should be coherent, logical, and practical. Reliability (Reliable): Regulations should be based on the best available knowledge from research and operational experience. Regulatory actions should always . . . lend stability to the nuclear operational and planning processes. Seemingly timeless, each principle was really a specific lesson drawn from regulatory experience. Over the years, the principles spurred continuous improvement at the NRC – among other actions, they helped the agency formulate its budgets and prioritize safety improvements in the aftermath of the accident at Fukushima Daiichi. Stakeholders also use the principles to hold the agency accountable. They have been valuable reference points for agency critics when they believe the NRC has not measured up to its own standards of excellence. 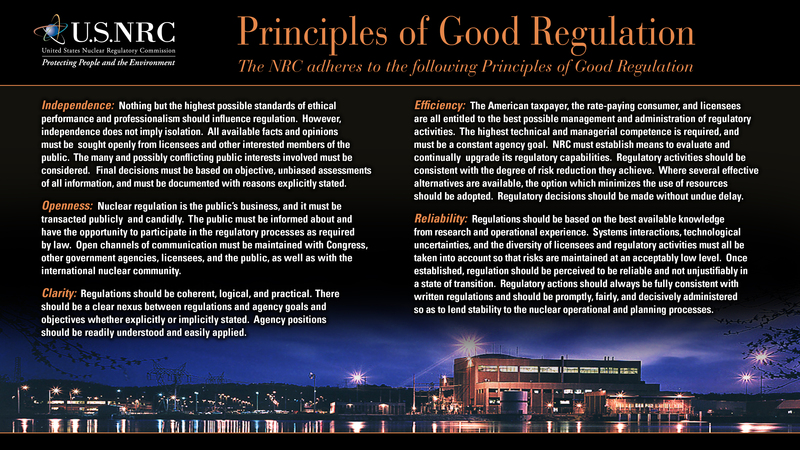 Even after 25 years, with the changes within and external to the NRC, these Principles of Good Regulation remain the agency’s calling card abroad and touchstones of excellence at home.